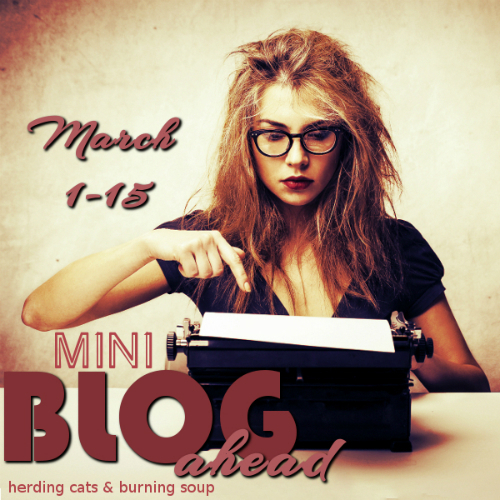 I’m signing up for the Mini Blog Ahead Challenge from Anna at Herding Cats & Burning Soup. Essentially, the goal is to write and schedule 15 posts in 15 days — but they can’t post until after the challenge is over. In other words, you’re trying to get ahead, not just keep up. I’ve done the month-long Blog Ahead challenge before, and didn’t manage to get a full 30 posts ahead, so I realize I may not make the 15-in-15 goal this time. But even if I only get a few posts ahead, that’s better than none! It’s time for Blog Ahead 2018! Every post ahead is an awesome thing 😀 Good luck with the mini challenge! It is indeed! I have plenty of already-read ARCs to write reviews for, and some other posts I’ve been mulling over for a while, so as long as I can squeeze out enough time to work on them, I have more than enough posts to write. I haven’t signed up yet, but it’s my plan. Like you, I doubt I’ll manage 15 in 15, but every post ahead is a good! Good luck! Thank you, and good luck to you, too!